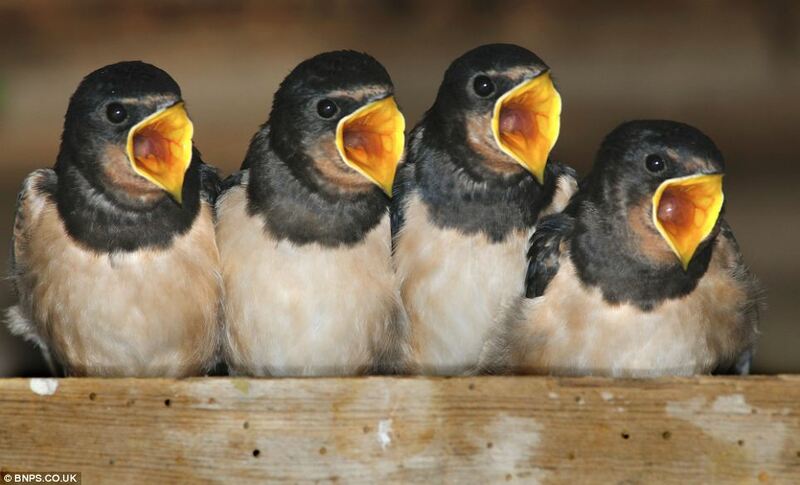 These baby swallows have much to chirp about. Their nest, built in a barn that was about to be demolished, was saved in an elaborate removal operation by the building’s owners. Colin and Susy Varndell covered it in a tea towel, cut away the beam to which it was attached, and then reattached the beam to a part of the barn in Netherbury, Dorset, that was being left. The parents soon found their chicks, which leaves the youngsters nothing to worry about – other than lining up and shouting for supper. The Varndells couldn’t afford to delay the work and wait three or four weeks for the fledgling birds to flee the nest because their planning permission would have expired. So they draped a tea-towel over the nest, cut the wooden beam away complete with the nest and very carefully moved it into a part of the barn that isn’t due to be demolished. They then screwed the section of wood into the loft and carried on with dismantling the rest of the building. The chicks’ mum and dad soon found their new home when they returned with supper – a moment Colin captured on his camera. Wildlife enthusiast Colin, 60, from Netherbury, near Beaminster, Dorset, said it was unusual to come across baby swallows this late in the year. He said: ‘Swallows migrate here from Africa in April and they start nesting straight away and the first brood usually hatches in May and leave the nest after three weeks. ‘The adults will then usually have a second brood. ‘We would have liked to have postponed the demolition when we found the nesting birds to let them grow and leave the nest. ‘But we didn’t have a choice because the planning permission expires in three weeks. ‘We thought it was best to try and move the nest and the only way of doing that without disturbing the chicks was cutting away the nogging they were on. ‘Susy put a towel over the nest and I used a saw to cut the wood away and we then screwed it into another part of the roof while we got on with the demolition. ‘The adults came back later and it took them a few minutes to find the nest’s new position.